I Love You More Than Carrots: "No, That's Not Your Dada.." And Other Miscellanous "Why's.."
"No, That's Not Your Dada.." And Other Miscellanous "Why's.."
Why is it, that as soon as one's child becomes mobile, more specifically my child, their forehead automatically connects with every sharp object in the house? It truly seems as if the second that Carter started crawling, he literally bumps his head into every sharp corner of every single wall in our entire house. It's as if his head is magnetized to these corners by a force greather than the two of us. And to think, I laughed at that soft-coated crawling helmet that I saw that baby wearing in the magazine last week... Why is it, that my son chooses the exact milisecond that I happen to turn my back to him probably to pee or breathe, to shove that giant piece of dog kibble into his mouth and chipmunk-it so far away that I need the Jaws Of Life to pry his little mouth open and extract it? And where did this kibble even come from? Sheepie hasn't eaten that brand of kibble in... months. How come my child insists on reaching out to the attractive young Marine in line ahead of us at the post office, screaming "Dada Dada Dada" at the top of his lungs? It only makes for an incredibly awkward couple of minutes as I try to explain to The Marine, while casually flashing my wedding bands all over, that I am in fact married and that my husband may or may not resemble him from behind.. with one eye shut. And that no, my darling child does not make a habit of referring to random strangers as his "Dada," and no, this is not how I pick up dates. Why do I want to simultaneously be Best Friends Forever and Ever with not only this Mama, but also her crazycakes clients? I just have it in my head that we would get along swimmingly. You know, once I could get past that wicked speech inmpediment/accent. Why is it that my child couldn't care less about the hundreds of dollars of toys he has scattered throughout our house but has become virtually obsessed with both my iPhone and DSLR? These are Mama's toys, my friend. Not for babies. Now, go play with Dada's old Motorola Razor. And finally, how come one's child has no qualms sleeping through two loads of laundry, dinner prep and both dusting and laundry-folding, but the minute I try to sit down to blog, Kindle or catch up on my other besties, Bethenny and the Real Housewives, sleep is almost impossible to be had? Has Daddy been talking to you, Carter? Happy Tuesday, Loyals! I love Rosie Pope...Bravo is my go-to for all amazingness (Hello, Bethenny!) but I find it hard to get past what ever is going on with her speech too. My boyfriend thought she was deaf the first time he heard her! Her store is to die for though. Emmaline has recently started going after my DSLR as soon as she lays eyes on it. That is a super cute picture of Carter! Silly kiddos--I remember my sisters favorite thing ever was a giant tupperware bowl. And to think we spent all kinds of money on her! Heehee! Love it! I can totally relate. Mia has gotten over the phone stage, but was OBSESSED for a long time. We are currently in the "touch it" stage. She must touch everything...it's great especially when we're at the grocery and "trying to make it quick." Seriously ... the toy vs phone/camera thing is a mystery to me as well. HOW does she know ALREADY at 7 months of age what belongs to her and what doesn't and that those things that don't belong to her are FAR more appealing than those that do? Confession: I actually contemplated putting some of her toys in a basket and play with them, telling her that these are for Mommy only and that she can't play with them. Then MAYBE she'll want them? LOVE Rosie Pope, but her speech does get me every once in a while. As for playing with "mama's toys" AJ is 14 months old and her eyes light up and get as big as saucers when she even thinks about my iPhone! Ha! It sounds like Carter keeps his head down while crawling too! I tell T all the time, "look up while you are crawling!" I think he thinks he will go faster! And he sticks his tongue out while doing it, so now my greater fear: he is going to bite the **** out of his tongue! Colton is at the age were he will hit his head on something because he thinks it is funny! He also thinks he can walk on water, he showed me his trick the other day at my SIL when he tried to walk into her pool! Your baby is so stinking cute!! 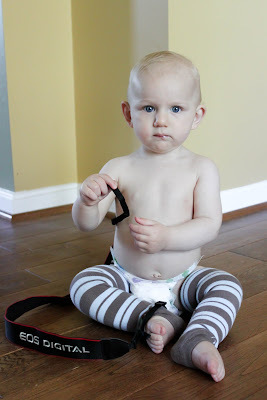 I just found your blog and OMG so many things in here are me and my little guy to a "T"! My little one sports millions of babylegs, which my hubby hates :), I LOVE Bethenny and RH. Ahh yes, and my son is magnetized to walls, corners, and hard floors as well. We, too, have tried to distract him with the ol' razor.. But this boy only likes iPhones :) glad to be following you! Ah! Pregnant in Heels is my new DVR obesession. We can't figure out if she has an accent or a lisp...what gives?! And her clients? Woah. My favorite was the one who called her unborn child a virus life sucker whom she had no bond with and had not one single thing purchased for and was surprised Rosie brought in a therapist. Ummm...really? I love coming to read your blog, because everytime, I swear, it is something that I could have written about my life. I can't tell you how many times my kids heads face planted on the bucket window seals when they were learning to walk. Love Rosie too, her clients? Not soo much. They be CRAZY!! Carter is such a doll! LOVE that pic!